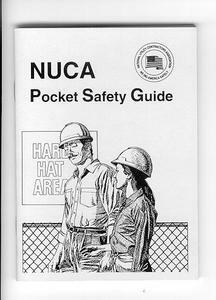 Shirt pocket workplace safety guide covers 22 common construction site safety issues—confined space, electrical, PPE, equipment, trenching, materials handling, signs & barricades, welding, ladders, etc. --- 50 pages. This construction safety book is also available in Spanish. An Excellent pocket guide for the field crew members ! !